پگاه, احسان, جواهریان, عبدالرحیم, نوروزی, داود. (773). محاسبه اندازه خانک و دهانه کوچ در طراحی عملیات لرزه‏نگاری سه‌بُعدی با استفاده از مدل سرعت خطی: بررسی موردی میدان نفتی اهواز. 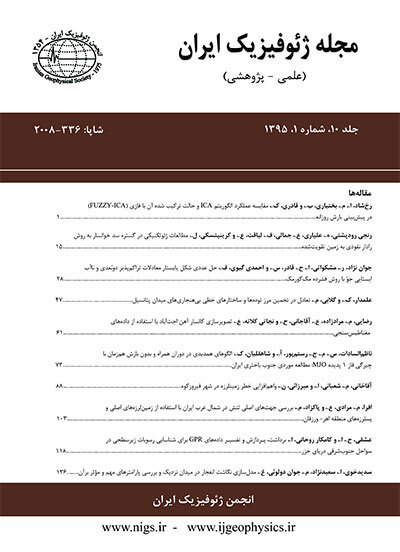 مجله ژئوفیزیک ایران, 6(4), 50-61. احسان پگاه; عبدالرحیم جواهریان; داود نوروزی. "محاسبه اندازه خانک و دهانه کوچ در طراحی عملیات لرزه‏نگاری سه‌بُعدی با استفاده از مدل سرعت خطی: بررسی موردی میدان نفتی اهواز". مجله ژئوفیزیک ایران, 6, 4, 773, 50-61. پگاه, احسان, جواهریان, عبدالرحیم, نوروزی, داود. (773). 'محاسبه اندازه خانک و دهانه کوچ در طراحی عملیات لرزه‏نگاری سه‌بُعدی با استفاده از مدل سرعت خطی: بررسی موردی میدان نفتی اهواز', مجله ژئوفیزیک ایران, 6(4), pp. 50-61. پگاه, احسان, جواهریان, عبدالرحیم, نوروزی, داود. محاسبه اندازه خانک و دهانه کوچ در طراحی عملیات لرزه‏نگاری سه‌بُعدی با استفاده از مدل سرعت خطی: بررسی موردی میدان نفتی اهواز. مجله ژئوفیزیک ایران, 773; 6(4): 50-61. در اکتشافات نفت سرعت سیر امواج در زمین به علت ناهمسانگرد بودن آن در جهت‌های افقی و قائم یکسان نیست. اما این فرض را که با حرکت در جهت افقی برای بیشتر مناطق، تغییرات سرعت لرزه‏ای کوچک است، می‏توان با دقت خوبی در صنعت اکتشاف ذخایر هیدروکربوری به کار برد که این نیز در نتیجه تغییرات کم در چگالی و خواص کشسانی لایه‏ها در این جهت است. تغییرات افقی سرعت عموماً خیلی کُندتر از تغییرات در راستای قائم است بنابراین اغلب منطقه برداشت را به ناحیه‏های کوچک‌تری تقسیم می‏کنند، به‌طوری‌که بتوان از تغییرات افقی در داخل هرکدام صرف‌نظر کرد و توزیع سرعت قائم یکسانی را به کار برد. اکثر روابط محاسبه اندازه خانک و دهانه کوچ که به سرعت وابسته هستند بر اصل فرض ثابت بودن آن استوار‏ند. در این مقاله محاسبه این دو کمیت در طراحی عملیات لرزه‏نگاری سه‌بُعدی میدان نفتی اهواز با استفاده از مدل سرعت خطی صورت می‏گیرد. از طرفی چون اندازه خانک و دهانه کوچ از مؤثرترین عوامل تأثیرگذار بر کیفیت داده‏های برداشت شده و همچنین هزینه اجرای عملیات و پردازش داده‏ها هستند، لذا روش طراحی بیان شده در این مقاله که از محاسبات مربوط به مدل سرعت متغیر پیشنهاد شد باعث می‏شود که علاوه بر حفظ مناسب کیفیت داده‏های برداشت شده و دست‏یابی به مقادیر مطلوب کمیت‏های موثر در کیفیت اطلاعات، رابطه میان هزینه برداشت و اطلاعات به‌دست آمده نیز به شرایطی بهینه برسد. In oil exploration, because of the anisotropy of the earth, the velocity of the waves in horizontal and vertical directions are not uniform; however, with a good accuracy in exploration procedures, we can assume that in a layer, velocity changes are limited as a results of slow variations in density as well as the elastic properties of the layers in these horizontal directions. In general, variations of the above mentioned parameters in horizontal directions are much slower than in vertical ones. For this reason, the acquisition area is often divided into smaller areas; horizontal variations are neglected while the same vertical velocity distributions are applied in any sub-area. There are basically two methods in calculation of the bin size and migration aperture in a 3-D seismic survey design. The first method is based on using a constant velocity model which is not compatible with real conditions. In this model, we assume that the medium between the surface of the earth and the target layer is replaced with supposed layer and ascribe a constant amount velocity to this layer that is equal to the average velocity in medium between the surface and the target layer. The second method uses the model wherein the velocity changes with depth and therefore a linear velocity model is assumed which is more compatible with reality in comparison with the previous method. Whereas the linear velocity method can include all important wave propagation effects, it involves a certain circular logic. This method, involves building a detailed subsurface velocity model and uses ray tracing or other simulation techniques to customize the survey for the local subsurface. In Ahwaz Oil Field, the main target was Asmari Formation and the deep target was Fahlian Formation. The 3-D seismic survey design of Ahwaz Oil Field was performed on the main target located in the depth of 2900 m and the deep target located in the depth of 5000 m from the mean sea level. Ground level was about 15 to 40 m higher than the sea level in this area. By considering the check shot, VSP and sonic log data from 14 well logs, the image area was divided into 14 parts, so that the variations of the horizontal velocity could be neglected in each part and the constant contribution for the vertical velocity could be used. Finally, using the velocity values at the desired vertical depth to the reflection point (target depth), the dip angles of the target horizon (dip of reflector at the reflection Point) and the maximum frequency reflected from the main target, we were able to calculate the bin size and migration aperture in each part. At last, we could select a value for the bin size in this project. In this study, we examined the parameters of the velocity-dependent 3-D seismic survey design. These parameters included the bin size and migration aperture. Conventional formula for the bin size and migration aperture for Ahwaz Oil Field was carried out based on the linear model between the velocity and depth. As an intermediate between constant velocity and interval velocity model, we have given expressions valid for a linear velocity function. By using the linear velocity model, the design parameters incorporated first-order ray bending. Hence, this method was adjusted to the reality and led to better results compared to a constant velocity model. Linear V(z) is an attractive approximation for three reasons. First, this kind of velocity variation captures the first-order effect of the pressure and the temperature increases with depth. It does not require detailed knowledge of the subsurface velocities. Second, analytical expressions are available for the ray path geometry and travel times in such a medium. Third, the linear V(z) propagation allows turning waves which have potential for imaging dips beyond 90 degrees. Migration aperture is overestimated by constant velocity calculations, whereas the bin size is underestimated and this results in an increase in costs. On the other hand, calculations based on a linear velocity model require a less migration aperture and a larger bin size. The bin size and migration aperture are two sensitive economy parameters. Hence, using a larger bin size and a smaller migration aperture obtained from a linear velocity model, the cost of a 3-D seismic survey design will be decreased. پگاه، ا.، 1388، طراحی عملیات لرزه‏نگاری سه‌بُعدی میدان نفتی اهواز با استفاده از داده‏های موجود و مطالعه نوفه‏های footprint حاصل از تغییرات پارامترها در طراحی، پایان‏نامه کارشناسی ارشد، موسسه ژئوفیزیک، دانشگاه تهران. پگاه، ا.، جواهریان، ع. ر.، و نوروزی، د.، 1391، بررسی نوفه اثر انگشتی حاصل از طراحی عملیات لرزه‏نگاری سه‌بُعدی میدان نفتی اهواز: مجله فیزیک زمین و فضا، جلد 38 (1) ، 145-160. سپه‏وند، س.، 1386، گزارش تکمیلی زمین‌شناسی چاه اهواز-307 (خامی)، اداره زمین‌شناسی تحت‌الارضی، اداره کل زمین‌شناسی، مدیریت اکتشاف شرکت ملی نفت ایران. Bee, M. F., Bearden, J. M., Herkenhoff, E. F., Suplyanto, H., and Koestoer, B., 1994, Efficient 3D seismic surveys in a jungle environment: First Break, 12, 253-259. Cordsen, A., Galbraith, M., and Peirce, J., 2000, Planning land 3-D seismic surveys, Soc. Expl. Geophys., Tulsa, Oklahoma. Ebrom, D., Li, X., McDonald, J., and Lu, L., 1995, Bin spacing in land 3-D seismic survey an horizontal resolution in time slices: The Leading Edge, 14, 37-40. Evans, B. J., 1997, A handbook for seismic data acquisition: Soc. Expl. Geophys., Tulsa, Oklahoma. Liner, C. L., and Gobeli, R., 1996, Bin size and linear v(z): 67th Ann. Internat. Mtg., Soc. Expl. Geophys, Expanded Abstracts, 43-46. Liner, C. L., and Gobeli, R., 1997, 3-D seismic survey design and linear V(z): 67th Ann. Internat. Mtg., Soc. Expl. Geophys, Expanded Abstracts, 43-46. Liner, C. L., Gobeli, R., and Underwood, W. D., 1997, Aspects of 3-D seismic survey design for linear v(z) media: 59th Mtg. Eur. Assoc. Expl. Geophys., Abstracts, Paper B002. Liner, C. L., Underwood, W. D., 1999, 3-D seismic survey design for linear V(z) media: Geophysics, 64, 486-493. Margrave, G. F., 1997, Seismic acquisition parameter considerations for a linear velocity medium: 67th Ann. Internat. Mtg., Soc. Expl. Geophys., Expanded Abstracts, 47-50. Pegah, E., Feiz Aghaei, B., Javaherian, A. R., and Nowroozi, D., Determination of Bin size and Migration aperture in 3-D seismic survey design for AHWAZ oil field with using linear velocity model (LVZ): EAGE, Expanded Abstract, First International Petroleum Conference & Exhibition, Shiraz, Iran, 4-6 May 2009. Slotnick, M. M., 1959, Lessons in seismic computing: Soc. Expl. Geophys. Stone, D. G., 1994, Designing seismic surveys in two and three dimensions, Soc. Expl. Geophys., Tulsa, Oklahoma. Telford, W. M., Geldart, L. P., and Sheriff, R. E., 1990, Applied geophysics, 2nd ed: Cambridge Univ. Press. Vermeer, G. J. O., 2005, 3-D seismic survey design, Soc. Expl. Geophys., Tulsa, Oklahoma. “VISTA 2D/3D Seismic Data Processing” software, Version 5.1., GEDCO, Calgary, Canada.